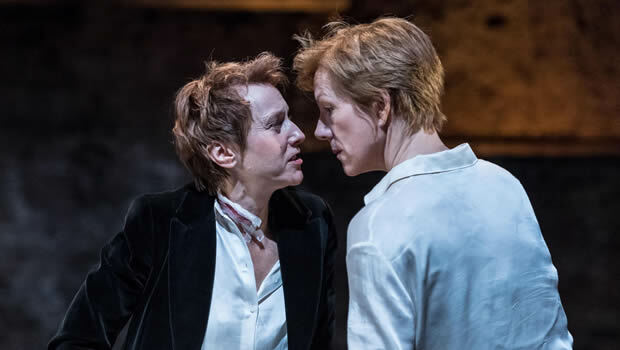 "a contemporary drama with two fierce leading women"
After an acclaimed run at the Almeida, Robert Icke (of Oresteia fame) brings his tempestuous production of Mary Stuart to the Duke of York's Theatre. First staged in 1800, he has rewired Frederick Schiller's political saga into a contemporary drama with two fierce leading women that electrify the stage. Beginning with a coin toss, the fates of the actors are decided; who will play the victim and who will play the victor? It's an interesting stylistic choice, and one that wholly resonates throughout the piece – fate can be cemented with the simple flip of a coin. Is this how Elizabeth I chose to sentence her sister? Mary Stuart fleshes out the final moments of the Queen of Scots before she was sentenced to death; Mary makes peace with her sentence, whilst a tempestuous Elizabeth bats back and forth. In this production, the coin chose Juliet Stephenson as Elizabeth and Lia Williams as Mary. With a simple flick of the head, Stephenson is a sharp, witty, yet turbulently emotional Queen, whose voice drips with honey and growls with ferocity. It's a blistering performance, matched by Williams' wild Mary, who is simultaneously feral and heavenly. Surprisingly, there are moments of humour in what is predominantly a rather dramatic production. Stephenson captures the cynicism of Elizabeth; how she is forced to bend to the will of her people who will never be pleased either way. John Light's Earl of Leicester treads the line between the two Queens, capturing the slight unease in his trickery. Elliot Levey gives a fine performance as Burleigh, who is in it all for himself. But through the humour, there's a strong sense of unease that ripples through the audience. Why does the production, set hundreds of years ago, resonate so clearly today? With two central women battling in an arena-like set, aptly designed by Hildegard Bechtler, it's a literal fight to the death, with people from all sides clamouring for Mary's release, or her execution. Can you please an entire country with one split-second decision? And when it all goes wrong, who can you blame? Toward the end, a poignant moment is realised. As Mary prepares for her death, by donning a plain nightdress, Elizabeth is dressed up in her white face-paint and gaudy finery, which is so large that she can barely move. Mary circles her like a restless conscience before leaving Elizabeth onstage, alone. She looks ridiculous, clownish. Whilst the production feels altogether rather melodramatic, assisted by Paul Arditti’s rumbling soundscape, it's these moments of clarity that are utterly compelling. And when Stephenson and Williams are on stage together, it is impossible not to be spellbound. But without these magnetic leading actresses, it’s difficult to see how else this play is revelatory. What extra steps can we take to push historic dramas? 23 January 2018 - "a contemporary drama with two fierce leading women"